Home › News › Looking to Buy a Home? 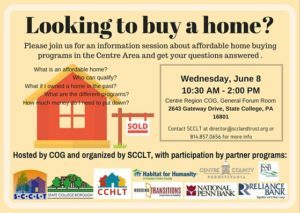 Stop by for an info session on affordable home buying programs in Centre County! Do you have questions like who can qualify, how much do I need for a down payment, etc.? Get them answered over some light refreshments. Come & go as you please. We would love to talk with you about our two, new homes on Woodycrest St., how to qualify & apply, and define a community land trust home. Also, you will receive a special invitation to our first Open House on Sunday, June 26 from 1-4pm! Join our Facebook Event for updates & reminders! Centre County Housing and Land Trust strengthens communities through the development and stewardship of permanently affordable homes for people of low- to moderate-income in Centre County, PA. Since 2007, CCHLT has operated as a 501(c)(3) non-profit featuring the collaborative effort of five local organizations to focus on: promoting and preserving of affordable housing; providing education; creating partnerships; and assisting municipalities on affordable housing policies. More information about CCHLT and its programs is available atwww.cchlt.org. Follow CCHLT on Twitter @CentreCountyHLT, on Facebook at www.facebook.com/CCHLT, or sign up for updates on CCHLT’s Email List. ‹ What is Centre Gives?